A military post was first established here in 1868 and named Sherman Barracks after the famous Civil War general, William Tecumseh Sherman. The post's name was soon changed to Omaha Barracks and, in 1878, to Fort Omaha. In 1879, General George Crook, noted Indian fighter and head (1875-1882, 1886-1888) of the Army's Department of the Platte, occupied a new brick home here, which is still standing. By the late 1880's, the 80-some acres of Fort Omaha had become insufficient for the Army's needs. A larger post, Fort Crook, was established near Bellevue and Fort Omaha was closed in 1896. In 1905, it reopened as an Army Signal Corps training school. Closed in 1913, the fort again reopened in 1916, this time as a training school for the crews of Army observation balloons. About 16,000 men trained here in preparation for service in World War I. When the Army declared Fort Omaha surplus property in 1947, it became a Naval Reserve Manpower Center. Since then it has served as a recruiting, training, and administrative facility for several branches of the armed forces. 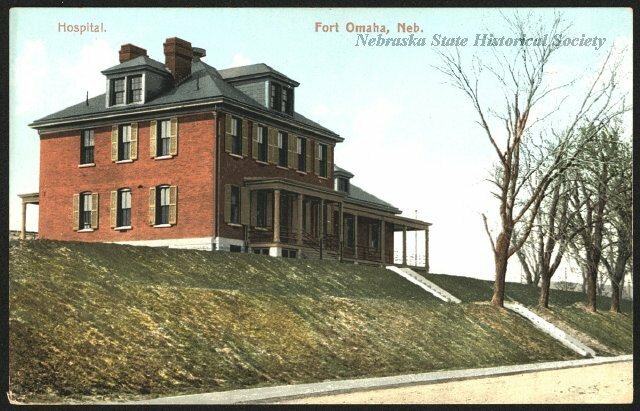 “Fort Omaha,” Explore Nebraska History, accessed April 18, 2019, https://mynehistory.com/items/show/175.